THE TRIADS: BOOK ONE is now OUT OF PRINT. There are only a limited number of copies available. Triads: Book One has been superceded by a new edition titled Holy Hesychia with a new translation and commentary by Robin Amis. Holy Hesychia is available from Amazon. 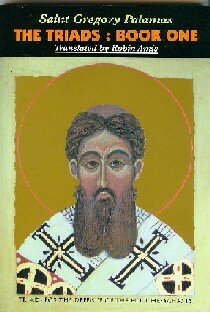 Triads: Book One is an English translation by Robin Amis of the key work by monk - Saint Gregory Palamas, who, at the very beginnings of Rationalist thinking in Europe, left his spiritual life on Mount Athos to oppose the doctrines of Italian monks just then leading the new shift to Rationalism which has dominated Western thought ever-since. Moving to Constantinople, he lost the debate, but his arguments have come down to the present time, perhaps because their clarity is such that when understood they still have much to tell us. He seems to be the only good Christian author to question the modern rationalist views which have dominated our Western world for the past 700 years.